Our goal is to alleviate some of the stress of shipping during holiday time, by providing clear ship-by dates as early as possible for our US-based customers. Today ShipStation, the leading web-based e-commerce shipping solution, released their 5th annual infographic offering the shipping cutoff dates for the upcoming holiday season. The infographic includes information from the top three U.S. shipping carriers, FedEx, UPS and USPS. 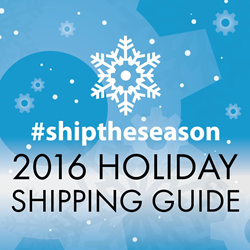 The ship-by dates provide helpful information to both shoppers and sellers to make sure that their gift orders arrive in advance of the holidays. ShipStation began their annual tradition of collecting the ship-by dates and sharing them with the broader e-commerce world back in 2012, making this year’s infographic their fifth—just in time to celebrate ShipStation’s five-year anniversary as well as making this the earliest release of these dates. Their relationships with the shipping carriers allows them to get the dates out so far ahead of the holiday season.